Indonesia consist of various ethnics, local and immigrants ethnics. Javanese, Bataknese, Padangnese, Sundanese are some part of big local ethnics, in other side; Chinese, Indians, Arabians are parts of immigrants ethnics. These ethnics live together in harmony from the ancient time. Indonesia has some bad experience in ethnics problems, the coming of colonizers with its divisive politics or more well known as devide et empera politics has changed the harmonization culture of Indonesia. Hatred to some ethnics, especially the Chinese ethnics due to their economics succeed grown, added by the unsuccessful of President Suharto regime in vanishing this issue. The top of this matter blown in 1998, triggered by the fell of President Suharto regime, many Chinese robbed and treated unfairly. Today, everything runs smoothly, all ethnics already live together in harmony. To totally eliminates this issue, tourism can take a part of it. A large number of tourism studies have addressed economic issues, but there has been little investigation of the contribution of tourism to political issues. Richter (1983a:314) has observed, “The role tourism plays in influencing international relations is understudied but scarcely unimportant. ”The role of tourism in facilitating ethnicity or cultural cohesiveness is one of the potential contributions that tourism can make as an agent of political socialization (Richter 1983a). Although there is a lack of research indicating the circumstances under which tourism can promote reconciliation among nations, there is a widespread belief that it does contribute to this end. Richter has suggested that governments use tourism as a diplomatic barometer of their closeness and affinity to each other. She cites Stock as observing, “The flow of tourism between two nations can be used as a sign of the level of salience between the two nations and their people” (Richter1983a:324). One attraction that can be made as a role model is Keraton Kasepuhan, Keraton means palace, and Kasepuhan means the respected older. Keraton Kasepuhan (Kasepuhan Palace) is a major tourist attraction in the city of Cirebon, West Java, Indonesia, the shape of the building and various collections of ancient artifacts in the palace is already widely known as a blend of various elements of religion and culture in the design and ancient object in the Keraton Kasepuhan. Keraton Kasepuhan is a combination of the three religions, namely Hinduism, Islam and Buddhism, as well as the three cultures, namely Java, China, and Europe. This combination makes the Keraton Kasepuhan more special than other palace. Overall, the palace complex consists of the palace itself, the square, as well as the mosque. This design is similar to Keraton Yogyakarta and Solo, a representation of Islamic architect, however, Keraton Kasepuhan still has strong Hindu elements. Palace wall consisting of bricks and shapes similar to the palace gate architecture of buildings such as the palace of Majapahit Hindu, from cultural perspective, the presence of Siti Hinggil and pavilion building is a representation of Java. Meanwhile, there is also a ceramic wall which has two shades, Europe and China. In the Dewandaru Garden located in the center of the palace complex, Hindu elements can be found in the form of an ox statue, named Nandu. Meanwhile, Europe elements can be seen from a cannon, a gift from Thomas Stanford Raffles. 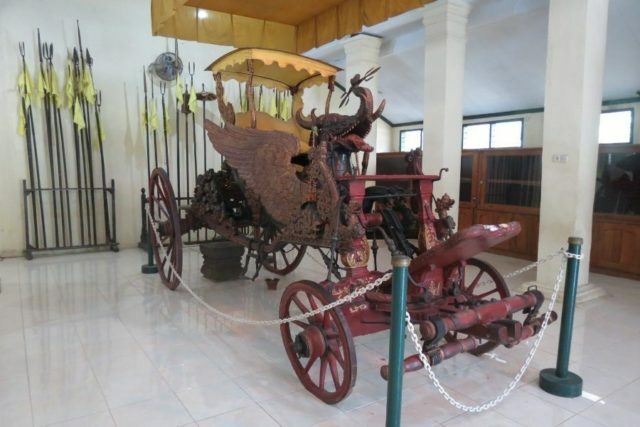 Palace’s ancient objects which shows clearly a blend of elements of different religions and cultures is Singa (lion) Barong carriage, the first old advanced carriage made in Indonesia. This carriage design symbolizes the friendship between religions. At the front of the carriage, there is a form of animal that is a combination of three animals at once, elephant, Burak (moslem bird’s symbol), and dragon. Elephant is the symbol of Hinduism, Burak is the symbol of Islam, while the dragon is the symbol of Buddha. The Carriage has a special suspension system as sophisticated as today car. The difference, this suspension technique does not use a spring system, but the skin. There are four leather belt that makes this carriage is more comfortable. The other specialty of this Singa (lion) Barong carriage is burak (moslem bird) wing that can be moved when the carriage is running, this makes the wings could serve as a fan for the king. Keraton Kasepuhan was built in 1430 by Prince Walang Sungsang or Cakrabuana, the crown prince of the Kingdom of Pajajaran. 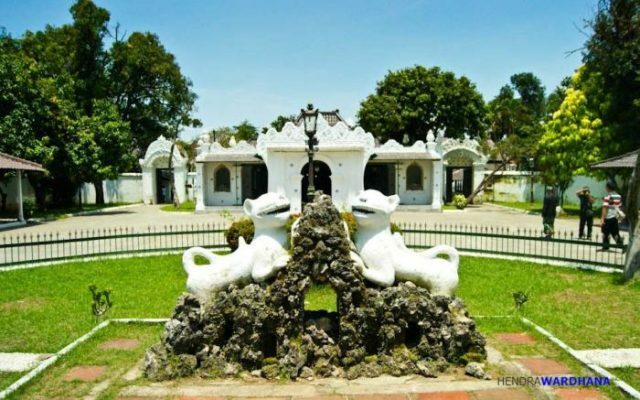 When the palace was built, Cirebon is still called Caruban. The oldest building of the palace is Keraton Pakungwati. In the palace complex, there is a glory wells. The wells water is often used for various rituals. Now, the condition of the oldest buildings has been a lot of damage. Keraton Kasepuhan is not as grand as Keraton Yogyakarta or Solo,yet Keraton Kasepuhan is still interesting to visit. Various ancient objects stored, ranging from Prabu Siliwangi paintings to carvings of Kama Sutra and various ancient gamelan, Javanese music instruments. Keraton Kasepuhan can be said as the symbol of Nusantara (Indonesia), unifying 3 religions, 3 culture blended as one. We can say, Keraton Kasepuhan given us a sample of Indonesia unity, as written at the symbol of Indonesia nation, Burung Garuda (Garuda bird); written between its legs; Bhinneka Tunggal Ika means unity in difference. We hope all Indonesian knows that living in harmony amongst various ethnics already be our culture, shown and proved by our ancestors. 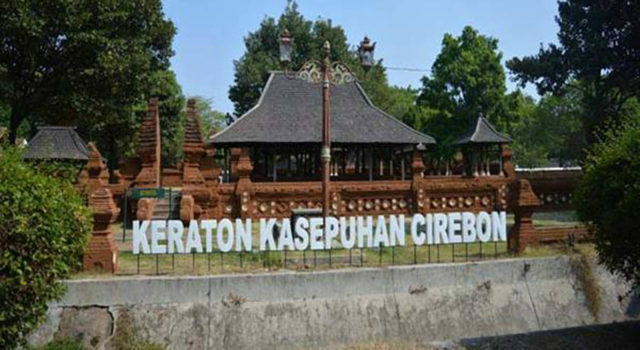 Keraton Kasepuhan Cirebon is a good role model of it. The ethnics chaos 1998 has become a black shadow of Indonesia living harmonization, we expect in won’t happen again.